How much is that donation in your window? Calculate the Costs. I get this question a lot: how much should it cost to process a gift? It’s a valid question most easily handled with: “It depends.” Well, I’m tired of that answer so I’ve devised a calculation. My math is not as important as your organization’s math, but we should all be more focused on how to deliver more resources to forward our missions (i.e., streamline costs and/or increase revenues). 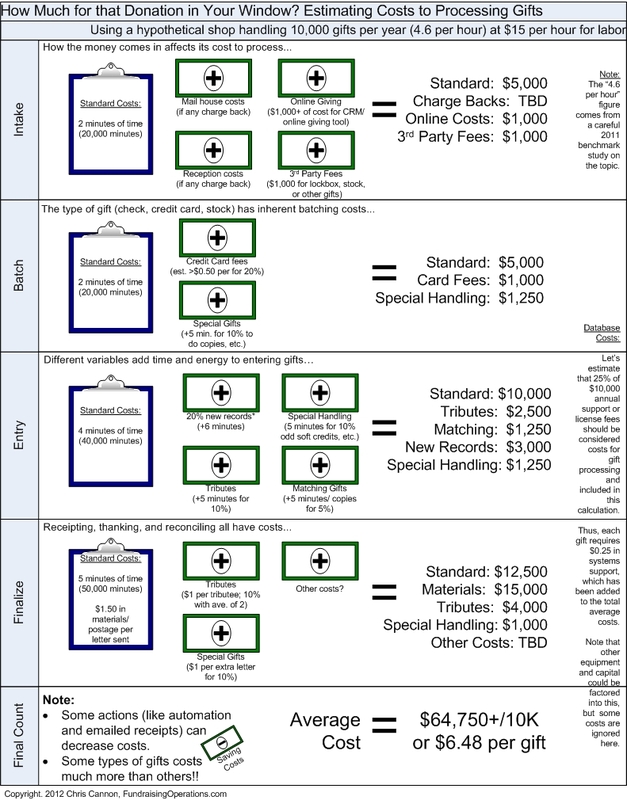 What are the costs of processing a gift or pledge? The components vary, by gift type, organization type, and others. The main cost is staff time, but we should also include a portion of the database costs, any services or service fees, and the materials/resources involved. Intake: how the gift comes in affects costs. Batching: the type of gift and associated information should be factored in. Entry: some gifts take a lot longer to enter than others. Finalization: receipts, thank yous, and reconciliation all take time and money. The bottom line is that all gifts cost time, energy, and resources to process. Is your cost $6.50 per gift? Is it much more? Less? If your team is too efficient, you may be missing stewardship or quality control opportunities. Below some level, a gift costs an organization money. That number is probably closer to $20 for some gifts (tributes) than anyone would like to admit, especially if your team processes thousands of $20 gifts. The nature of philanthropy makes it nearly impossible (and certainly un-palatable) to reject small gifts, but messaging around the impact of giving could switch from the overly naive “every dollar counts” notion to something more sophisticated. So, be sure your efforts are pointing donors in the right direction. Don’t take my word for it. Do the math. Then, with your organization’s answer(s), try to shape donor behaviors through smarter direct response strategies supported by streamlining your operations so that you deliver as much money as possible to support your mission. And, please share your calculations and ideas in the comments. What data-driven tactics are OK? A quick note. An uproar about data modeling was in full swing the last few days. The NYT reported that Target uses data to, well, target customers. It got one wrong (spilling the beans about a daughter’s pregnancy to her father!) by getting it right (quickly gathering, analyzing and distributing marketing based on data points that knew more about the daughter than the dad). The data screening and data modeling trends have long taken hold in our industry. Now we are starting to see even more potentially questionable applications of data taken from the corporate world, raising some base questions: What about privacy? What about effectiveness? What about competitive advantage? What about creeping people out? This raises the question: how far can and should data analysis go in fundraising? As a card-carrying member of APRA, I value research, analytics and prospect management. Data are the fuel for fundraising. As a father, or as a recipient of seemingly countless fundraising calls from poorly trained solicitors via robo-dialing, or as a donor, I wonder everyday where fundraisers should draw the line. My starting point is typically not just can you raise money with a data-driven tactic but will the tactic build relationships? In the long run, gimmicks and disingenuous strategies deliver fewer results than donor-centric and mission-critical approaches. Which is it? But, it may not be long before unheard of tactics become commonplace approaches. Do benefits outweigh risks? So, the short answer to this profound question is that focusing on relationships first should provide the answer for your organization’s approach to what data and when. I’m planning a more thorough look at the topic later this year (HIPAA, FERPA, national do not call lists, consumer data applications, and more). In the meantime, I welcome your cases, conundrums, and ideas. Fundraising operations is a tough business. The many moving parts, the level of detail, the (mis)understanding across different departments and donors…these all make it a difficult area to effectively manage. Perception is particularly challenging to handle. Sometimes, a single anecdote shapes our colleagues’ entire view of operations. One bad gift, one bad report, or one bad training experience can spoil the lot. But, you can avoid some of the pitfalls and improve perceptions. Have a look at this video (it’s a little long but worth it) to get some ideas on the common culprits and best solutions. What issues have most shaped your perceptions? The Association of Donor Relations Professionals (ADRP) is a terrific group of dedicated professionals helping our industry focus on the essential element of great fundraising–stewardship. I had a chance to conduct a webinar for a few hundred ADRP members on the topic of balancing donor relations with operations. This is a vitally important issue. The stronger the integration between the two efforts, the better stewardship your donors will receive. This depiction illustrates the overlap. High-volume, high-tech donor relations is heavily reliant on operations. That is, receipts and acknowledgments generated from the database, accurate gift and recognition recording, and many other areas of great stewardship require great operational effectiveness. Technology: ultimately these are means to an end, but using these tools well will improve the partnership. Online Engagement: some organizations would disagree, but, like technology, this is more of a channel than a strategy. It can be a valuable channel, though, and is often a little too technical for the stewardship team to manage alone. Prospect Development: operations often plays a bigger role on the front-end, leading to a two-stage process, but coordination is critical. Internal Reporting: operations holds the key to great reports. The more accurate, complete, and timely, the better donor relations can leverage information to build relationships with donors at the time of and between gifts. Data: accurate data are the basis for good reports, good receipts, and generally convincing your donors that you are an organization with its act together and worth supporting. Receipts and Acknowledgments: these are vitally important because they are often the first step in a chain of stewardship activities. Quick and accurate completion is often the responsibility of both teams. Impact Reports: reporting back to donors requires many sources. Operations and donor relations should work together here to ensure every donor gets the information they deserve. Recognition: the outward expression of gratitude for giving is mostly in the donor relations portfolio, but really great operations teams are vastly improving how that information is gathered, stored, and analyzed. Front-of-the-Line: I developed this idea to focus attention on top donors and prospects. The 80/20 rule is an axiom adopted by stewardship but operations folks sometimes just start at the top of the pile and work down. Instead, great partnerships should develop plans like the BIDMC team. Their SIRP (Stewardship Immediate Response Plan) ensures donors get the attention they deserve. And, the operations folks created solutions in their donor database to handle and streamline their process. Exception Management: Stewardship is essentially about exceptions. Operations is sometimes too, though it is more on negative exceptions (errors). An integrated team will use points 1-9 to develop a thoughtful process that allows for disciplined handling of good and bad exceptions, so that your best donors and prospects always receive the lion’s share of your resources. This last point is depicted here. The balance between operations and stewardship can be best summed up as a partnership to maximize donor experiences (partly by minimizing errors) in the upper right quadrant. Don’t sweat the small stuff in the bottom left quadrant. Synchronizing operations and stewardship requires attention to data, technology, reporting, and business processes. To get these parts, pieces, programs, and processes spinning like a top, take a careful look at these ten areas of integration. The tighter the partnership between operations and stewardship, the better it is for you, your organization, and, most importantly, your donors. It seems that 2012 will be a year for change in fundraising operations. The proverbial dust is starting to settle on one of the two biggest fundraising operations stories in months. In January, Datatel and SungardHE finalized their merger (click here for details). January also held the other big story about the purchase of Convio by Blackbaud (click here for details). The Twitterverse has been abuzz. ListServs, blog posts, calls to account managers…the volume of attention to these issues has been significant. How much does it matter? In total, not much. Wondering if your technology is well-used. Click here for a Test. Fundraising is still a predominantly top-down, inside-out business (with some exceptions). Grass-roots, high-volume, high-tech fundraising is neat and (somewhat) new, but the essentials–asking engaged people of means for very large gifts–is where most campaigns are won. And, frankly, an organization’s database of choice affects these sorts of gifts less than we might think. For example, have a look at this technology transition cycle. What you will notice is that it’s a loop: you’re never quite finished because you should be constantly learning and adapting the use of your technology. Without long-range, comprehensive implementation plans to fully leverage our technology, we tend to have databases that house name, address, giving, and a few other details.